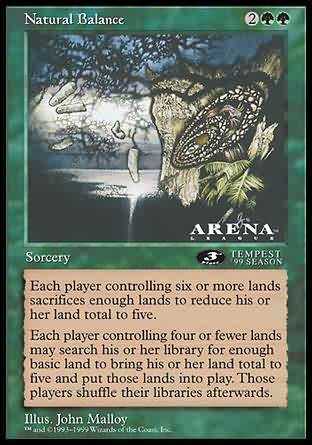 Each player controlling six or more lands sacrifices enough lands to reduce his or her land total to five. Each player controlling four or fewer lands may search his or her library for enough basic land to bring his or her land total to five and put those lands into play. Those players shuffle their libraries afterwards. Each player who controls six or more lands chooses five lands he or she controls and sacrifices the rest. Each player who controls four or fewer lands may search his or her library for X basic land cards and put them into play, where X is five minus the number of lands he or she controls. Then each player who searched his or her library this way shuffles it.